We’ve heard this before, right? Baden-Powell employed the “Scouting is a game” analogy long before anyone else, and it is the best analogy I’ve found for explaining the wonderfully complex, intriguing, idea that is Scouting. We have to be careful because analogies break down at some point. While Scouting is a game in many ways, it’s actually something far more than that. 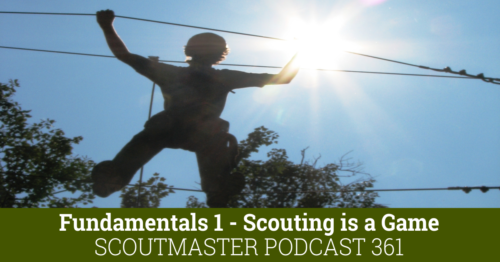 In this podcast I’ll kick off a series of foundational talks about Scouting. I”d hesitate to call these talks introductory, because we’ll be trying to wrap our heads around some very big ideas. My hope is they help you make sense of just what we are up to as Scouters. The best way I heard it described was “the paradox of Scouting”. It is very hard to stay in lane when we parents know what needs to be done and how to do it. Thanks for keeping us grounded and reminding us that Scouting is about the Process itself, not the results. I look forward to the rest of your series. It’s a subtle point, but critical nonetheless. Although coaches of youth-sports are endlessly exasperated by parents who lack understanding of the finer points of the game (offside in soccer, for example, forget trying to explain it), at least there’s a basic understanding of the objective of the game (put the ball into the net). In Boy Scouting, however, I don’t think there’s even a consistent understanding of the objective of the game. Many parents come in thinking the game is just to “make Eagle Scout” and the way to do that is “collect merit badges”. Other parents think it’s only about collecting new outdoor experiences – skipping those which their scout may have already done before – as though the program is just a Student Activities Center. This latter misunderstanding is particularly insidious as the attitude not only foregoes an experienced scout’s possible enjoyment of presenting a learned-skill to younger scouts, but also erodes the unit of experienced scouts which in turn undermines the scout-lead structure as well as the patrol method. How do we as scouters ensure there’s a better understanding of the objective of the game? Thanks, Clarke, for your continued wisdom and guidance. One of the more consistent things about Scouting is some parents don’t understand it. This is nothing new, it has been around as long as Scouting, so there is apparently no solution, it’s a price of doing business as a Scouter. Because it is an intractable problem I tend to ignore it, support all my Scouts no matter what direction their parents influence them to take. Distressingly this means some of my Scouts won’t get all they possibly can out of the program, but that’s just the empty part of a half full glass. I am presently an ASM to my son who is the SM of a new (4/1/2017) Troop 17 in Harrisville, IN. I was his Den Daddy and eventually his troop’s SM. When he earned the Eagle rank, he dropped out to attend college and I dropped out too (not to attend college, but for other reasons,yet, I regret that I did drop out; I should have stayed involved). When his son joined as a Tiger, my son stepped up to be the den leader and I came on as his assistant. We have been involved all along the way and when it was time to cross over, the troop which we should have entered was NOT an active outdoor troop. The parents wanted us to continue with camping and hiking and FUN! Thus, we formed a new troop! OK, so now you have our background: My son and I are in the process of listening to ALL of your podcasts. You consistently remind me of the processes I employed back in the day. The troop back then was “boy led” – which was a tough row to hoe since the leaders I replaced led from so far out of sight that the scouts were in chaos and were struggling to function. After a year of working with the SPL, the troop became really boy led. We had a great last year before my son earned his Eagle. Our new troop, Troop 17, has been boy led from the start – not the easiest task to achieve since our scouts are only sixth and seventh graders. BUT, in less than a year, it is amazing how much the scouts have improved in becoming a true BOY LED TROOP! Your podcasts consistently offer both my son and me terrific insights. We appreciate your work! Thank you. Thanks Frank! Always good to hear things like this! I just wanted to thank you for your service to scouting and all of the Scouters like myself who need a little advice. I discovered your podcast a little over a year ago and enjoy it immensely. I am currently a Den Leader for a den of 7 Arrow of Light Scouts. I plan to follow my son and his Den over to the Troop in March when they cross over. I actually have been looking forward to being an assistant Scout Master for a few years now. Our Troop is boy led and will have around 40 Scouts when my Den joins them. They have a great Scout Master and a strong Committee backing him up. Unbeknownst to me, the Troop Leadership has been watching me from afar. Recently was aproached by our current Scout Master and asked if I would be interested in succeeding him as Scout Master. I of course said yes only to realize later what I just committed myself to. So now I find myself listening to your archive of podcasts and reading “Working The Patrol Method” to prepare myself. I am so grateful that you and other Scouters offer your hard earned lessons to those less experienced like myself. I know that the boys of Troop 142 will also be benefiting from this advice for many years to come. Thanks Ron! Glad to be of help!